​The arrival of automated driving is creating challenges for every organization which deals with roads and automobiles, and this includes GEWI as well as the GEWI customers worldwide. There has been a significant increase in requests from GEWI customers involving data which will be used by automated driving, particularly in providing real-time, highly accurate Work Zone data. 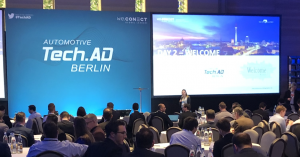 Because of the importance of this market, GEWI Executive Director Matthias Defee, attended the Automotive Tech.AD conference 11-12 March, 2019 in Berlin, Germany. In his position, Defee has been involved with both GEWI customers and Product Development on a daily basis since 2002, he is uniquely qualified to take the lessons learned from this conference and oversee implementation of relevant features into GEWI’s TIC Software product. The topics of all of the sessions at Automotive Tech.AD were either sensor technology, system and platform architecture, or perception algorithms. Only one company introduced the notion that something other than vehicle technology would be required to realize automated driving. For GEWI, all of this data is important and needs to be managed by existing (or new) TIC Product features. Another observation is that Navigation (with its need of dynamic data) is something that is seen for only defining the target/route. Driving along that route is solely done based on sensor input and there is potential that road operators could benefit from the perception model obtained from the suite of vehicle sensors. GEWI will be attending, exhibiting and presenting at many more conferences in 2019 and beyond to ensure the development plan for the TIC Software product remains on track with emerging technologies, data types and customer requirements.